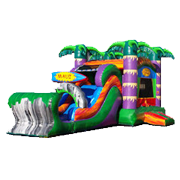 Under the blazing Louisiana sun, nothing is more refreshing and thrilling than a wet combo bouncer from Bounce E Bounce, LLC! 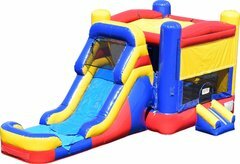 If you're looking for party entertainment solutions in Lafayette, it's hard to top the value of these large, colorful combo units! 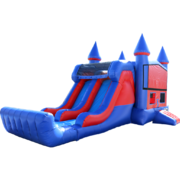 As the name suggests, the combo bouncers bring two fun inflatables into one package, giving your guests multiple ways to play. 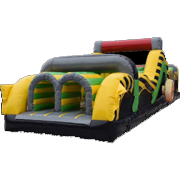 The bounce house portion allows them to hop around in a spacious bouncing area, while the attached slide gushes with water and invites guests to slide all the way towards the inflatable pool that sits at the bottom! 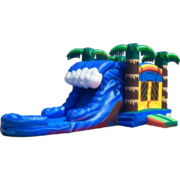 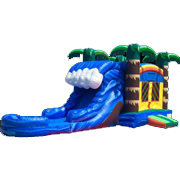 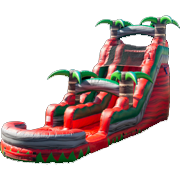 Explore our selection of wet combo bouncers below, where you'll find exciting offerings such as the Maui Water Slide Combo and the Tropical Wave Water Slide Combo! 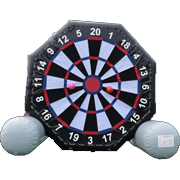 Best of all, Bounce E Bounce, LLC guarantees on-time delivery and setup all across Acadia Parish! 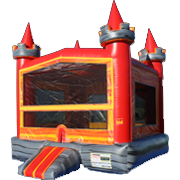 These units are especially popular during the hot summer months, so don't delay and book your combo party inflatable today! 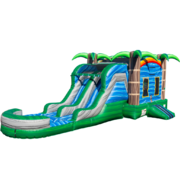 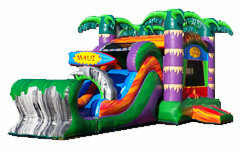 Scroll down to see all water combo bouncer rentals & click on the title or image for more info & online ordering.